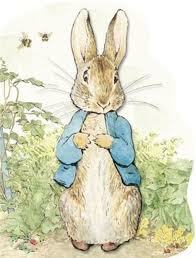 Peter Rabbit is a fictional character featured in various children's stories by the English writer Beatrix Potter. The character takes on human characteristics along with speaking and wearing human clothes and was actually named after Peter Piper, a pet rabbit Beatrix Potter had as a child. The stories origins started in a letter written by Beatrix Potter in 1893, to a five year old child who was ill, with the letter including drawings to illustrate the story. 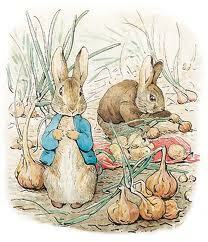 The original Beatrix Potter story titled 'The Tale of Peter Rabbit was first published in 1902 and centres around Peter's adventures in Mr McGregor's garden, filling himself with as much of Mr McGregor's vegetable crop as he can, before being chased, during which he loses his jacket and shoes. This tale, being the most well known, has sold more than 41 million copies worldwide and the character appeared in five more books. The fact that the series of stories have sold over 155 million copies worldwide, demonstrates the appeal of the character and the tales that were written around his adventures. 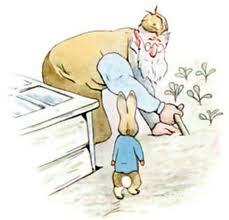 The follow up story, ' The Tale of Benjamin Bunny', was first published in 1904 and involves Peter and his cousin, Benjamin Bunny, returning to Mr McGregor's garden to try and find the clothes that Peter lost in the original tale. After being trapped by Mr McGregor's cat, Benjamin's father rescues them both. In 'The Tale of Mrs Tiggy-Winkle', first published in 1905, Peter has a small role, in which Peter and Benjamin are customers of Mrs Tiggy-Winkle. 'The Tale of the Flopsy Bunnies', first published in 1909, Peter features in a small role, where he is now an adult rabbit and the 'uncle' of Benjamin Bunnies' children, the Flopsy Bunnies. 'The Tale of Ginger and Pickles', first published in 1909, has Peter, along with several other characters, making a cameo appearance. The last tale, 'The Tale of Mr Tod', first published in 1912. Peter helps his cousin Benjamin find and rescue Benjamin's children from the badger Tommy Brock. They eventually succeed when Tommy Brock becomes involved in a scuffle with Mr Tod. In 1903, Beatrix Potter's character was the first soft toy to be patented, thereby becoming the oldest licensed character. 110th anniversary of the original tale and in the story; Peter is depicted as a child.